Android Nougat is almost be publicly released. And as an Android developer, we need to prepare ourself to adjust targetSdkVersion to the latest one, 24, to let everything works perfectly on the newest release of Android. And as always, everytime we adjust targetSdkVersion, we need to check and make sure that every single part of our code works perfectly fine. If you just simply change the number, I could say that your application is taking a high risk of crashing or malfunction. In this case, when you change your app's targetSdkVersion to 24, we need to check that every single function works flawlessly on Android Nougat (24). Summarily, file:// is not allowed to attach with Intent anymore or it will throw FileUriExposedException which may cause your app crash immediately called. 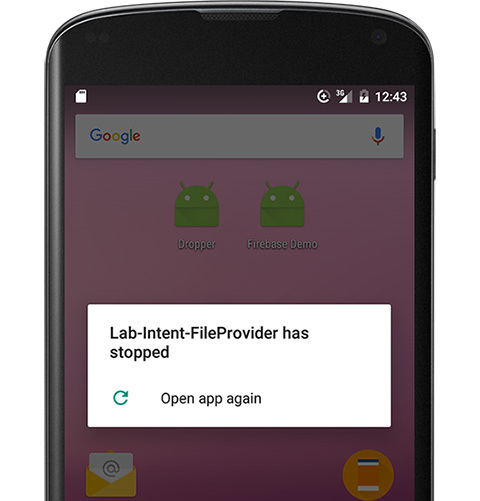 This blog will talk about this issue and also about the solution how to make it work on Android N.
You may be curious which situation that can really cause the problem. So to make it be easy to you all, let me show you a real usage example that causes crashing. 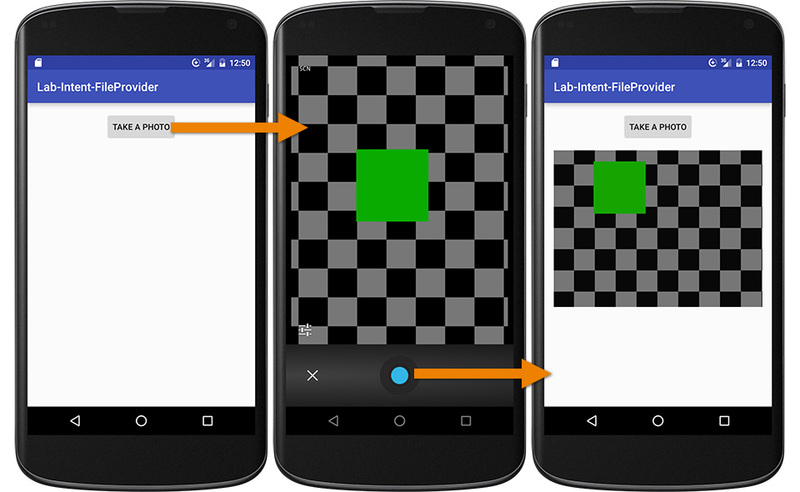 The easiest example is the way we take a photo through Intent with ACTION_IMAGE_CAPTURE type. 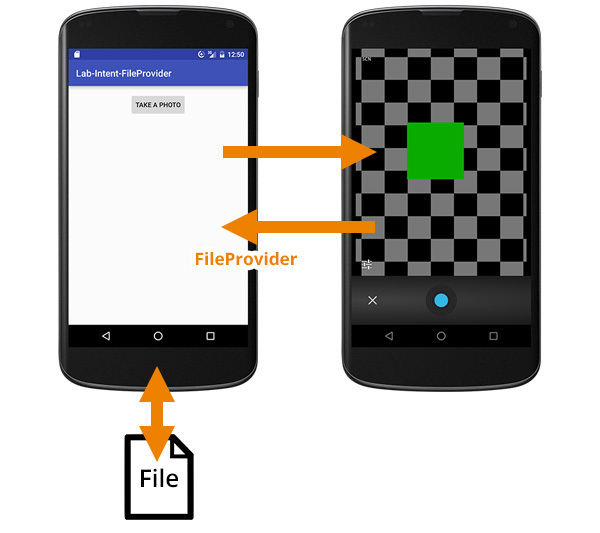 Previously we just pass the target file path with file:// format as an Intent extra which works fine on Android Pre-N but will just simply crash on Android N and above. Here is the code. Please note that you can find and download it from GitHub. When code above is run, there will be a Button shown on screen. Once Button is clicked, camera app will be launched to let you take a photo. After everything is done, the taken photo will be shown on the ImageView as a result. What the code does is quite straightforward. Generated file path pointed to DCIM folder under External Storage will be sent to camera app in file:// format and will be used as file path of a photo taken. Code above works fine even on Android Nougat since targetSdkVersion is still be 23. Now let's change it to 24. And here is the stacktrace. The reason is quite obvious. file:// is not allowed as an attached URI in Intent or FileUriExposedException would be thrown. And this is a big issue that you have to make sure that all code related to this case has already been fixed before releasing a new version with targetSdkVersion 24 or your app may crash on some of your user's device. Why Nougat does not allow passing file:// with Intent anymore? You may be curious why Android team decide to change this behavior. Actually there is a good reason behind. If file path is sent to the target application (Camera app in this case), file will be fully accessed through the Camera app's process not the sender one. But let's consider thoroughly, actually Camera is launched by our application to take a photo and save as a file on our app's behalf. So the access right to that file should be our app's not Camera's. 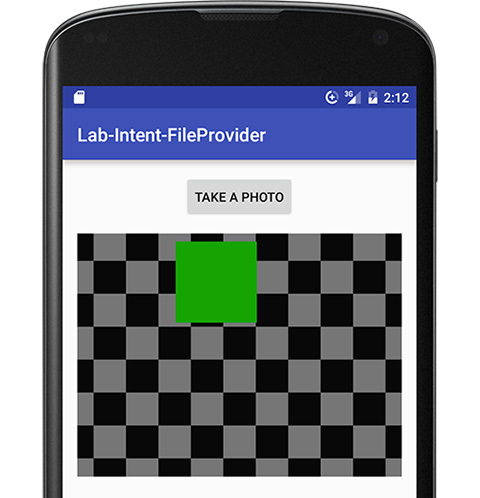 Every operation did with the file should be done through our application not by Camera app itself. And that's why file:// is now prohibited on targetSdkVersion 24 to force every developer to do this task in the proper way. And now, with FileProvider, file operation would be done through our app process like it supposes to be ! And then create a provider_paths.xml file in xml folder under res folder. Folder may be needed to create if it doesn't exist. The content of the file is shown below. It describes that we would like to share access to the External Storage at root folder (path=".") with the name external_files. Done! FileProvider is now declared and be ready to use. And .... done ! Your application should now work perfectly fine on any Android version including Android Nougat. Yah ! How about the existed app launched previously? As you can see from the experiment result above. This behavior will happen only when you change your app's targetSdkVersion to 24 or above. So if your previously launched application was set the targetSdkVersion to 23 or lower, it supposes not to be a problem even on Android Nougat. file:// should still works perfectly fine.